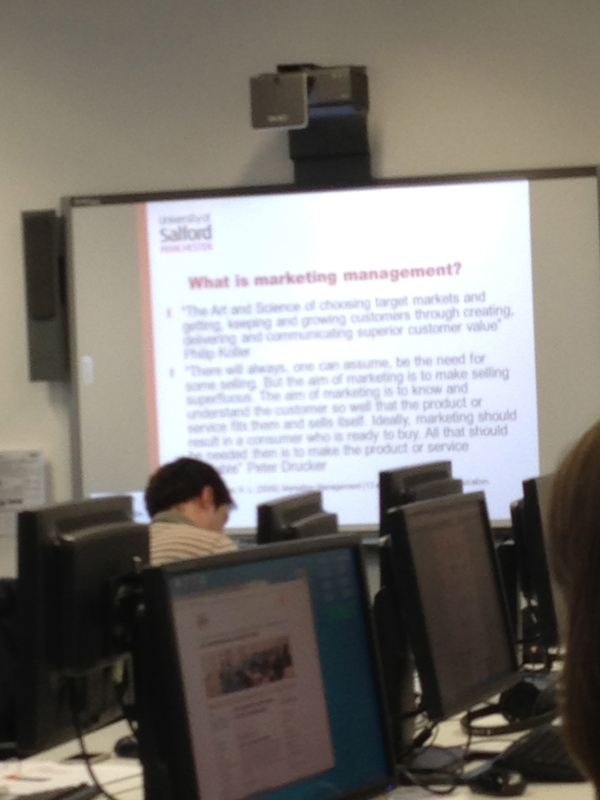 Flexible and innovative learning models and also CPD are actively supported by Salford University as outlined in the teaching and learning strategy (The University of Salford, 2013, p.13). On a wider level, QAA (2010, p.63) also supports the quality facilitation of collaborative learning in HE. Our Search and Social Media Marketing (SSMM) CPD course course outline covers social media tools such as LinkedIn, Twitter, Google+ and other web 2.0 tools. We also use some of these technologies to enable collaborative and flexible learning both inside and outside of the classroom. Thinking subject specifically, this reminds me of McLuhan’s (1967, p.26) concepts of the medium being the message or in this case, the medium being both the ILO and the learning support tool. Part of our ILO’s are to make the technologies become seamless (Anderson 2012, p.6) or an extension of the brain (McLuhan 1994). It would appear that there is some correlation between the subject matter and the learners confidence with technology as to how effective learning technologies may be (Beetham 2007, p.36) and this certainly rings true from my experience and that of my colleagues. 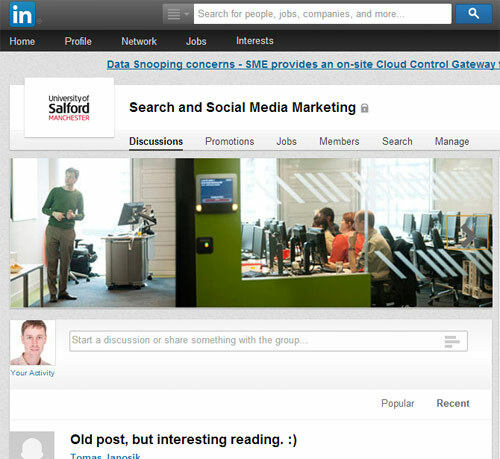 Our LinkedIn group is always relatively well used. Macdonald (2011, p.60) states that participation can be higher when use of a forum is aligned to assessment. In our case, the CPD course is not credit bearing and there is currently no formal assessment, so why is the forum so popular? I gathered feedback from my current SSMM cohort about how they felt about using all of the technologies including LinkedIn and they all unanimously found them useful. Our CPD students are sharing articles and resources and are generally motivated and keen to learn to advance their careers as predominantly mature students. This is a short course and we talk about the LinkedIn Group regularly in the class and make a point that there are useful resources and an opportunity to discuss and share knowledge. Research shows that using a forum in this way can help to support learning (Macdonald, p.60). We have a record number of people on the current SSMM course and people travelling to MediaCityUK from as far as the Lake district and Newcastle. In addition, most people are working full time, so there are increasing requests from students for access to digital materials, recording of lectures and synchronous live streams. These are things that I have experimented with over the last two years and are on the rise in HE (Beetham, 2007 p.57). Having participated in a fully online module using Blackboard, Twitter and Collaborate and studying the FDOL literature is really helping me to advance my understanding and to try new things. After Thursdays evening SSMM session I had something of a light-bulb moment about a potential plan for both making SSMM more flexible and opening it up to more distance learners. This strategy will involve professionally recording more sessions and also using Collaborate to live stream and record sessions. I also have an idea how we could improve our current offering of Dropbox and Google Docs to deliver a more central place for resources. This also ties with the quality standards guidelines around reliability and contingency plans (QAA 2010 p.59). I have started to research and discuss this further with colleagues. 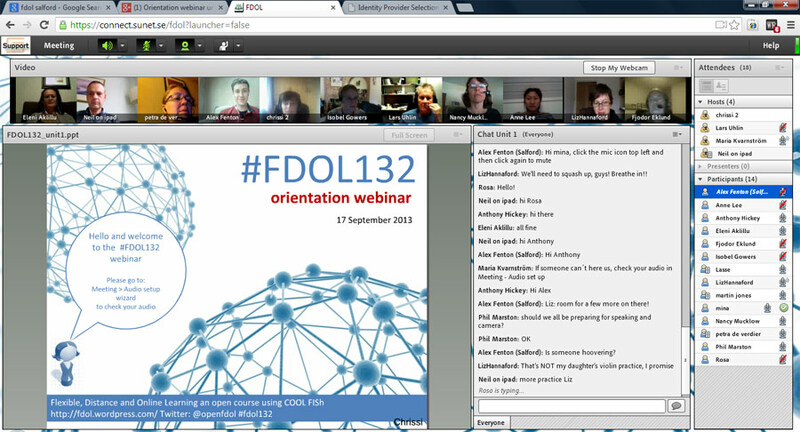 I want to use FDOL and my current SSMM course to continue to experiment with collaborative learning and then based on research and feedback, roll out a more flexible, blended version of SSMM for March 2014. Our SSMM MOOC project and FDOL have given me further inspiration and confidence to make the SSMM CPD course more flexible and blended. I am also conscious of UKPSF v1 – respecting individual learners and diverse learning communities, which is another driver in my thinking and an opportunity for positive change. The Tweet below was sent by a student after my first ever live stream session with Collaborate today. Beetham, H. & Sharpe, R. (Eds.). (2007). Rethinking Pedagogy for the Digital Age. (London, Routledge). The Quality Assurance Agency (QAA) for Higher Education. (2010). I would love to hear your thoughts about live streaming and recording sessions and whether you think it will improve the student experience. If you would like to participate, please enter the poll and/or a comment below.